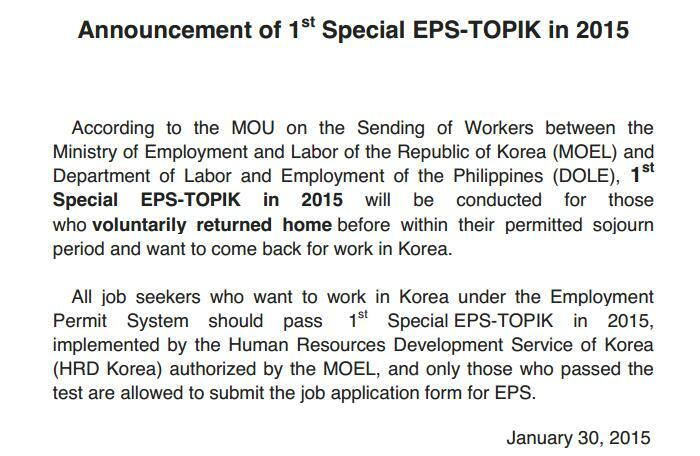 Great news for former EPS workers who are now in the Philippines. The 1st Special TOPIK test will be held early this year. The detailed announcement can be found on the website of the POEA. ÃšThe qualified list to be able to take the test will be attached with announcement. THE ONE DAY REGISTRATION IS ON FEBRUARY 5, 2015 AT THE 6TH FLOOR OF THE POEA BUILDING. The test date is MARCH 10, 2015. To help you prepare for the test ~ download the textbooks from the EPS Topik page of HRD Korea.